Henry Ford was an exceptionally knowledgeable and imaginative individual with regard to the technology required for the mass production of modern gas-powered motor vehicles. However, he did not read extensively, had a minimal formal education and was, apparently, ignorant about the nation's political system and history. At the start of World War I, Henry Ford declared his pacifism and asserted that his company would not produce armaments. Later he changed his mind. The Rouge plant is located in Dearborn because the Navy asked Ford to use his ingenuity and mass production skills to built ships for the war effort. Similarly, the defense establishment asked Detroit inventor Henry Leland to produce engines for planes, leading to the massive Lincoln Plant that stood for 80 years at Livernois and Warren. By 1915, Henry Ford was an acclaimed national and international hero because of his development of the massive production process that turned out reliable, inexpensive cars. Ford took great pride in his accomplishments, felt that he was a gifted individual and even considered running for President of the United States. He ran for U. S. Senator in 1918, but lost the election. As World War I dragged on, killing tens of thousands, Ford decided that he would go to Europe to meet with the heads of the warring nations and convince them to lay down their arms. He chartered an ocean liner and asked many of the nation's leading politicians to accompany him on his peace mission, a mission that he presumed would quickly end the long war. Originally, some national leaders agreed to join him, but most backed out when they realized that Ford's ideas were farfetched and totally unrealistic. Henry Ford sailed to Europe, met with very few national leaders and accomplished nothing. The Chicago Tribune strongly opposed Ford's efforts to secure peace in Europe and labeled him ignorant, arrogant and not patriotic. Ford was offended and decided, in 1917, to sue the Tribune for libel. The trial was held in a Michigan court room. Lawyers for the Tribune were fully aware of Ford's ignorance about American history, got him on the stand and demonstrated to the public that he did not know the date of the Revolutionary War, nor did he know about the several other wars the US fought in the Nineteenth Century. Ford claimed that Benedict Arnold was a writer and that chili con carne was a large Army. For almost three months, the Tribune's lawyers asked Ford questions that made him look simple-minded and ignorant. The jury, however, found in Ford's favor, but awarded damages of only six cents, so both side claimed victory. It may be that this public demonstration of Ford's ignorance about history that led him to develop the Henry Ford Museum. Ford publicly argued that most history books were bunk and not worth reading. However, he was an inveterate collector of things. He began to specialize a bit in collecting objects representing the nation's technological development, such as farm implements, home crafts objects and tools of every size, shape and form. Knowing this collecting habit, people began sending him objects for his expanding collection. To systemize his rapidly growing collection of objects and make them available to the public, Henry Ford created the Edison Institute. On October 21, 1929, President Hoover came to Dearborn to dedicate the Edison Institute to Ford's close friend, Thomas Alva Edison, who is memorialized by a marvelous fountain in Grand Circus Park. October 21, 1929 was the fiftieth anniversary of Edison's invention of the incandescent electric light and just eight days before the stock market toppled. Throughout the 1920s and early 1930s, Ford spent approximately thirty million of his own dollars to collect historical articles—most but not all of them from the United States. The indoor exhibition of his collection is housed in the Henry Ford Museum. The outdoor collection is located on the 90-acre Greenfield Village that adjoins the Henry Ford Museum. Robert Derrick was selected to build the Henry Ford Museum with a façade that replicates Independence Hall and Congress Hall in Philadelphia. 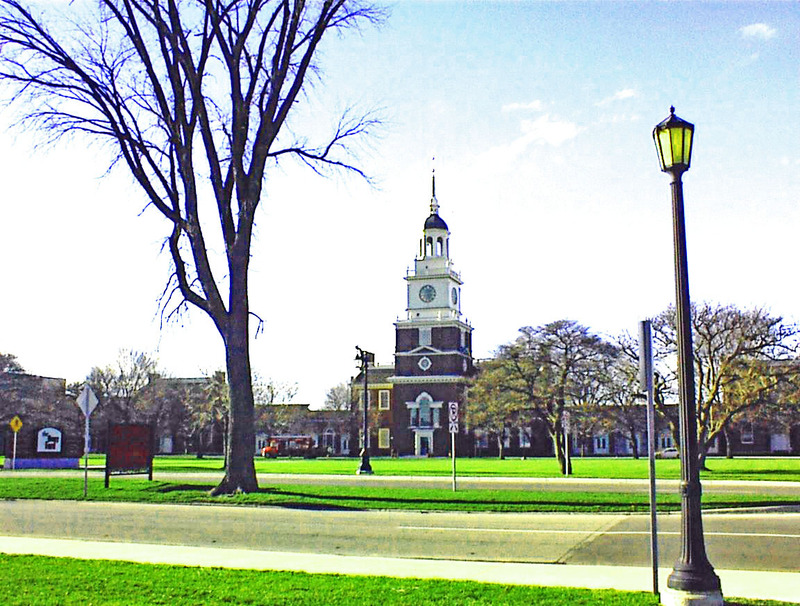 Architectural Style: Colonial in that the visible front of the Henry Ford Museum is a replication of Independence Hall in Philadelphia. State of Michigan Historic Marker: Erected: October 18, 1962. National Registry of Historic Sites: Listed October 20, 1969. Listed with Greenfield Village.